Is There a Substitute for Grapefruit in the 3-Day Diet? Despite the claims of the three-day diet, eating a specific combination of foods that includes grapefruit is not going to help you lose weight more quickly. While the diet offers alternatives to grapefruit, it's not grapefruit or lack thereof that helps you drop pounds -- it's the calorie restriction. The three-day diet, also referred to as the Military diet, claims it can help you lose 10 pounds in a week. The diet includes a strict meal plan that details what and how much you eat on each of the three days. Grapefruit appears on the meal plan only once at breakfast on day 1. This breakfast meal also includes black coffee and whole-wheat toast with peanut butter. According to the Military Diet website, the specific food combinations are designed to help burn fat, boost metabolism and aid weight loss. Grapefruit is low in calories and a good source of potassium and vitamin C, and makes a healthy addition to most diet plans. However, the citrus fruit is not for everyone. 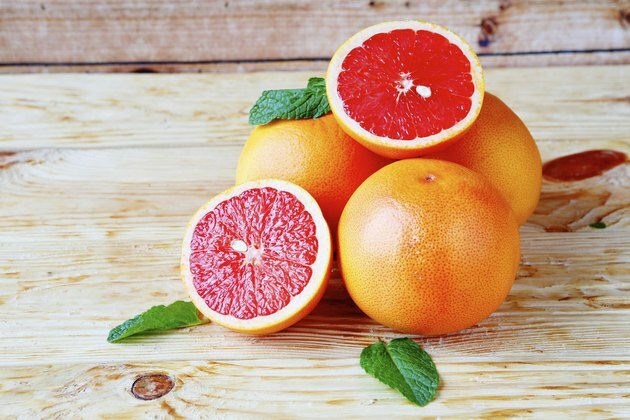 Grapefruit and its juice increase the rate of absorption of certain medications into your bloodstream, raising the concentration and the potential for adverse events. Medications that interact with grapefruit include those that lower cholesterol -- simvastatin -- and blood pressure -- nifedipine -- and some antihistamines such as fexofenadine. Your doctor or pharmacist should tell you if you're on any medications that interact with grapefruit. The U.S. Food and Drug Administration recommends you avoid grapefruit and its juice if you're on these medications. There are a few alternatives to grapefruit on the three-day diet, but they vary depending on the website you use for your diet plan. The Military Diet website says there is no good substitution for grapefruit, but if you can't eat it you can drink a glass of water with 1/2 teaspoon of baking soda instead. The 3DayMilitaryDiet.net website says you can substitute oranges or mandarin oranges for your grapefruit. The three-day diet helps you lose weight fast because it is a very low-calorie diet. According to the Military Diet website, you eat fewer than 1,000 calories each day on the plan. It is difficult to meet your nutritional needs on a very low-calorie diet, and the three-day diet may be inadequate in essential nutrients such as calcium and vitamin D. When you lose weight quickly, you are more than likely losing water and muscle rather than fat, says FamilyDoctor.org.